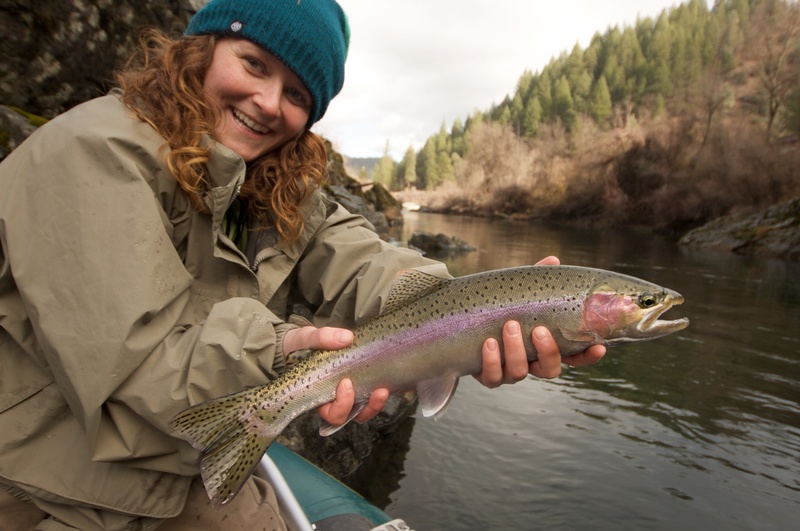 Trinity River fishing reports by fly fishing guides in Weaverville, CA. Trinity River has Wrong Name! The Trinity River is “the” tributary of the Klamath River and actually should have been named the South Fork of the Klamath or some other appropriate title. But thanks to the work of Major Pierson B. Reading’s and his erroneous calculations in 1845, it will forever be Trinity; as well as Trinity Lake, the Trinity Mountains and even Trinity County. The name stuck and the area in general began to adopt Reading’s blunder. Reading believing that the river emptied into Trinidad Bay (Trinity in English) and not into the Klamath sealed the fate of river forever. A creek was also named after the Major, and today it is an important but fragile spawning tributary on the upper river. The creek hosts a strong return of wild steelhead and also salmon but is closed to fishing to protect the fish. Major Reading was also involved in the Bear Flag Revolt which was an important movement giving the State of California a piece of what it has become today. Major Reading through his service with Sutter and Fremont was given the Mexican land grant, Rancho Buena Vista. The area of this vast estate nowadays is known as Redding, California and Cottonwood, California located on the banks of the Lower Sacramento River. Interestingly enough, this is one our other favorite place to fish and take people on guided fly fishing experiences. A group trip with smiles from all sides! Trip booked through The Fly Shop in Redding, CA. The Trinity River is approximately 165 miles long these days to the confluence of the Klamath River. This river system located in Northern California provides the fly angler with some of the most consistent and accessible waters to fish for Pacific steelhead in the country. Not to mention there is always fishing available regardless of the season. 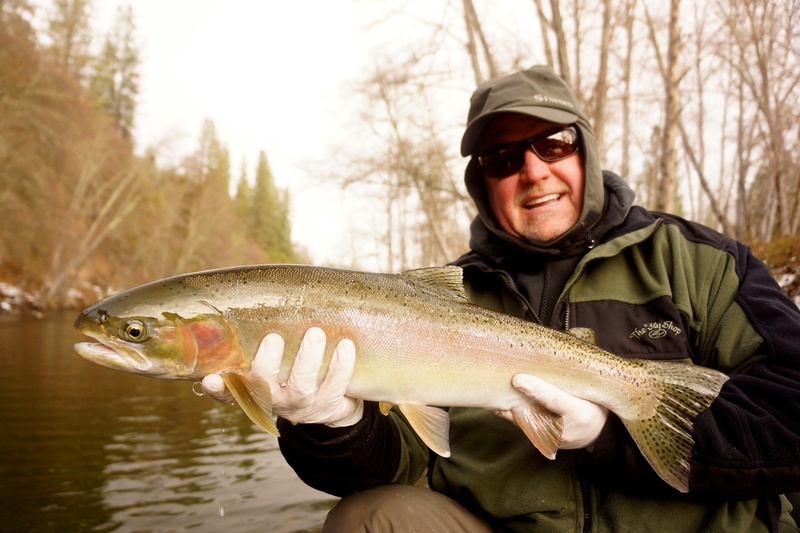 The river contains a variety of species but is best known for it’s salmon, steelhead and sea run brown trout. The Trinity River has also been deemed Wild and Scenic and is without question one of our favorite water systems not only in the West but across the globe. It’s close proximity to other world class fisheries makes the incorrectly named Trinity River the heart of our operation giving us striking power to reach other steelhead and trout packed rivers systems. A valuable resource to more than anglers the river faces some serious issues in the coming years, maybe months, that will need to be addressed. It’s river systems are doing well by today’s standards but this epicenter has the ability to flourish with the correct management of resources and by looking at the watershed as a whole; from the tops of Trinity Alps, downs to the mouth of Pacific, including the people that live and play within it’s grand kingdom. Overview map of the Trinity River in Northern California, Steelhead, trout and salmon paradise! What a week! Two rafts, three days and six BIG SMILES! This steelhead with a snorkel. Fly Fishing Guides in Redding, CA. The Trinity River has been producing some good fishing and solitude recently. Low water conditions have opened up unique teaching opportunities and scenarios that in the end make our clients better anglers and us better guides. Not to mention the weather is absolutely spectacular and it looks like the high pressure is going to stick around for a week or two at least. There have also been some dry fly opportunities showing up with more on the way as we get closer to March. Looking to try and intercept some sea bright chrome; do you want to explore some new waters? Yeah, we can do that. We’d love to hear from you. Don’t exist. Live. Get out, explore. Last week we had the pleasure of fishing with one of our favorite clients, not because she is the best fly fisherman we know, but she always manages to create a positive experience, have a great time and smile every second. A good attitude is everything with us, and Pam has it. While we were out to dinner at Market Street Steakhouse in downtown Redding, California we introduced her to our good friend Kelle. They hit it off like many of our friends do, and Pam invited her to join us the next day on the Trinity River. Needless to say we had a blast and Kelle even managed to land her first steelhead ever. On the the fly! It’s hard to call days like this work. Good clients, great fishing and a New Year… it can’t get any better. Thanks girls! It has been one month since the skies of the Trinity darkened and released some much needed precipitation: snow. Although it didn’t accumulate to much it all helps keep the system alive. The the weather has warmed slightly but there has still been the potential of ice in the guides and ice on the roads. If you plan on fishing the Highway 299 area during the winter months please drive cautiously especially in the morning. The fish we’ve been catching recently have been in and around different types of water from day to day: deep bouldery frog-water one, fast choppy riffles the next. 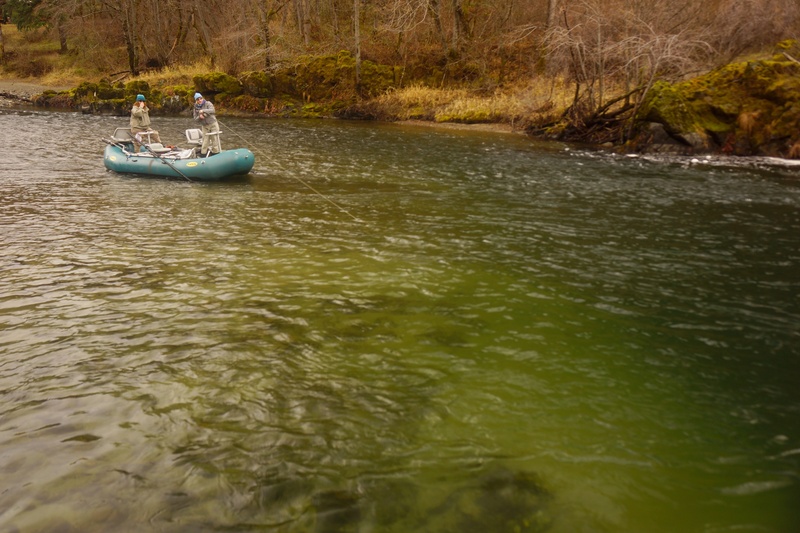 With the water temperatures around 40 degrees, the steelhead are favoring the softer side of the seams where the fast water of the run dumps into the deeper holes and depressions. Overall, quite a few of the fish are surprisingly on the move and the more we keep our flies in the water and properly present them throughout the day, the better the results. No surprise there but being able to cover all types of water with one setup helps increase the odds. The fish are slow, so slow your presentation down and be efficient allowing every fish in the area have a chance to see your fly. Good days are a given with such a gorgeous setting, but the best days we’ve seen have been while using Mercer’s Biot Poxy Golden Stones, brown or golden Solitude Stones, chartreuse Copper Johns, and olive Pheasant Tails. Of course the Superfloss Rubber Legs and egg variations will put a fish or two in the net as well. So you’ve fished the Trinity before but always in the fall, or maybe you haven’t had the time during the holidays? 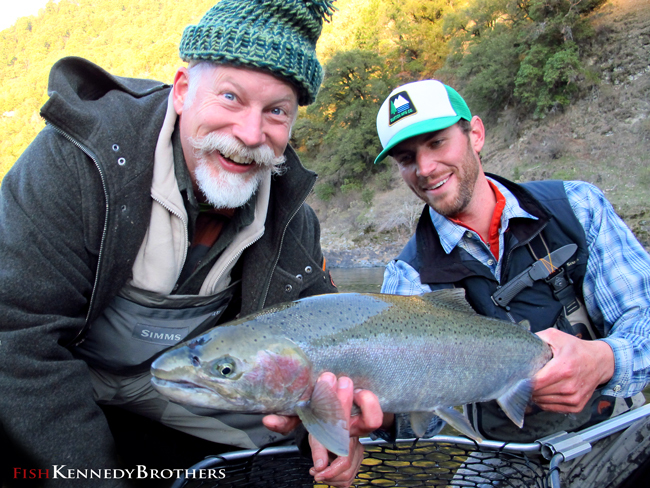 2014 has brought with it the best three months of the year, and we hope you’re ready to come join us for a couple days chasing California’s Winter Steelhead. The snow that one week ago blanketed the banks of the Trinity River has all but vanished, aside from the areas of perpetual and relentless winter shade. But the steelhead come anyway, perhaps slower and more regimented but they’re on a mission. The water temperatures have warmed, and activity is a direct result; steelhead are on the move, and grabby. The most effective patterns currently are golden or brown stonefly variations, fished deep and presented with a degree of stealth. Don’t give up on classic patterns either. We are also finding quite a few fish with upriver on the brain, mainly in the faster runs near hard current seams and transition areas. They are here! As expected for the day before Christmas, we were alone, not another fisherman in sight. Now, if we could only teach a reindeer how to row a boat.